If you have suffered from anxiety, depression or post-traumatic stress disorder following a car accident then you may be eligible to make a claim to compensate you for the difficult time you have been through. Although it is quite common to make a personal injury claim for physical injuries, you may not be aware that you are also able to make a claim for psychological and emotional trauma. The anxiety you could suffer following a car accident can affect your life just as much as a physical injury. Our experts at Advice.co.uk will be able to talk you through the claims process and help connect you with those who could successfully achieve the compensation you deserve. Call us today on 0161 696 9685 to find out more. Please read on to learn more about anxiety, depression and post-traumatic stress disorder following a car accident. What Is Shock, Anxiety And Trauma? I Am Suffering Anxiety And Travel Anxiety, What Should I Do? How Long Do I Have To Claim Compensation For Anxiety After A Car Crash? Why Make Your Claim For Anxiety After A Road Accident With Our Team? When we think about being involved in a car accident, most of us would consider the physical impact of a crash and the injuries that we may suffer. Although broken bones and cuts are painful and can cause ongoing discomfort, they are often much easier to treat than the emotional effects suffered by some individuals following a traumatic event such as a car accident. An individual who suffers from anxiety or a wider post-traumatic stress disorder may find it hard to talk about their problems and to find the appropriate treatment. If you have suffered from anxiety after a car crash then please be aware that you have every right to make a personal injury claim for the psychological impact of a car crash as well as the physical. 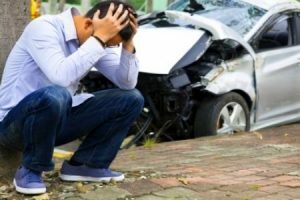 Advice.co.uk can offer helpful and empathetic information if you have been a victim of depression and anxiety after a car accident. Read on to find out more about the symptoms of anxiety, your treatment options and to learn more about how you can make a claim if you have experienced something akin to this. Although anxiety is very common, it is debilitating and unpleasant. Anxiety can range from a mild sense of worry, unease and fear right through to severe anxiety which can cause regular panic attacks. Following a traumatic event such as a car accident, travel anxiety is common and can be part of a bigger condition called post-traumatic stress disorder. Anxiety is often triggered by a stressful event such as an exam or a work interview. For our purposes we are looking at anxiety symptoms after a car accident. The emotional trauma that an individual suffers following a car crash. This is known by some as ‘fight or flight’ or our ‘caveman brain’. When faced with danger, our body produces adrenaline which makes our heart rate increase, giving us the ability to run faster away from danger should we need to. However, when we receive these signals during everyday life, even when we are out of danger, it can feel very unpleasant and leaves us feeling out of control. In order to avoid these feelings building up again, we may begin to avoid the trigger. In this case the trigger for anxiety would be travel. Following a car accident, some people may begin to avoid travelling altogether in order to avoid attacks of anxiety. Pre travel anxiety is the feeling of anxiety symptoms building up when you are about to begin a journey. Although many people who are involved in a car accident experience of certain level of nervousness and anxiety after a car crash, most people are able to move on and continue travelling as normal. Others however experience this pre travel anxiety for weeks ,months and even years following the car crash. It is very normal to experience emotional trauma after a car accident however, for some it can affect their quality of life considerably if they feel unable to get back into a car without experiencing overwhelming feelings of fear and anxiety. It is really important to seek medical advice if you are experiencing these types of anxiety attacks after a car accident. We don’t always attach the same importance to our mental health as we due to our physical health, but it is equally important that we are looked after psychologically and emotionally after a traumatic event. If you have experienced this type of ongoing emotional shock after a car accident then please speak to us at Advice.co.uk to find out how we can provide you with support to achieve compensation. Experiencing feelings of anxiety after a car crash will not necessarily lead to panic attacks, but it sometimes does. Whilst panic attacks can seem very frightening, they are not actually dangerous. It is however very difficult to live with the fear of an impending panic attack. It is equally uncomfortable to live with a general feeling of anxiety which can be debilitating, depressing and frightening. Depression and anxiety after a car accident is very common but should not be ignored. This personal injury compensation calculator type table will help you to get an idea of the amount you may be entitled to claim following your experiences with anxiety after a car crash. Bear in mind however that this is just an estimate and you will be able to get a more accurate idea of the compensation that you can claim after speaking with a personal injury solicitor who will take into account the specific details of your case. When you make a personal injury claim, you can be compensated for both your financial losses and non-financial losses. These are broken down into what we call general and special damages. General damages covers pain and suffering. This is worked out based on the physical or psychological damage you have suffered as a result of the accident. In general, the more serious the injury and the more long-lasting the symptoms, the larger the payout will be. Special damages cover any financial losses you have suffered as a result of your accident/injury/illness. Although treatment for mental health issues is available on the NHS, resources are limited and you may find that you need to use a private therapist to access the help that you need to recover if you are feeling depressed after a car accident. You can claim back any medical costs that are directly connected to your car crash injury, including medication. If you have incurred any out of pocket travel expenses as a result of travelling to and from medical appointments for example, then these can be claimed back as long as you have the receipts. As we have mentioned, anxiety can be debilitating and may affect your ability to go to work or to function effectively when you are there. If you have taken time off work as a result of your illness, then loss of earnings compensation will seek to reimburse you for any earnings that you have lost out on. If you have needed help around the house to help you recover from your injuries then you can make a claim for care costs to cover this expense. You may be unfamiliar with the feelings of anxiety and may be asking yourself ‘why do I feel different?’ You may be unsure whether what you are feeling is normal. Common symptoms of travel anxiety include a feeling of fear and dread when faced with the possibility of getting into a vehicle. You may feel so afraid that you are paralysed with fear. You may feel sweaty and shaky and feel your breath quickening. You may also have a sense of feeling numb or very cold. You won’t necessarily experience all of these symptoms but you are likely to suffer from some. Some people will also experience panic attacks when faced with getting in a car and may even become nauseous. If you are experiencing anxiety then you will probably get a fight or flight sensation and feel like you want to run away. The important thing to remember about anxiety symptoms is that no matter how frightening they feel, they are not dangerous and you can overcome them. You may become depressed because the feelings of anxiety are getting you down. Although it is a psychological problem, anxiety can often manifest in physical symptoms. Our heart beats faster and we have a sense of having butterflies in our stomach. This is due to a fight or flight reaction that our body instinctively creates, in order to enable us to run from danger if we need to. Over time, chronic anxiety can grow and become a bigger problem in our lives which is why it is so important to find a way to overcome it and seek help. If you experience these symptoms of anxiety following a car accident, there is a very good chance that you will be able to make a compensation claim for psychological and emotional suffering caused by the crash if it was not your fault. Advice.co.uk can help. Although you may worry that beginning the claims process may make your anxiety worse, we can reassure you that your chosen solicitor will handle as much of your case as possible on your behalf. The process of making a compensation claim is easier than you think and the payout that you receive can help you pay for the treatment you need and any adjustments you have needed to make in your life. To maximize your chances of launching a successful claim we suggest that you do the following as soon as possible after your car accident. See a healthcare professional and ensure that your anxiety symptoms have been documented. Take down any details of witnesses to the accident, your solicitor may wish to contact the witnesses at a later date. Take any photographs you can at the scene of the accident, this will help your lawyer to prove liability. If you incur any out-of-pocket expenses then keep the receipts as you may be able to claim these back. Cognitive behavioural therapy. CBT treatment helps you to identify your negative thoughts and work through them. It is thought that the benefits of CBT are longer lasting than the benefits of prescribed medication. Applied relaxation. This is a technique that teaches you to relax your muscles when you feel anxious. It is taught by an applied relaxation therapist usually once a week for a few months. It is possible for your GP to prescribe you a medication to treat your symptoms. There are a variety of medications to try so don’t be disappointed if your first prescription doesn’t work for you. In a case involving an individual who suffered post-traumatic stress disorder following a car crash, an award of £11,200 was made in general damages. The claimant in this case was just 6 years old and was travelling in the front of his father’s car. They were involved in a collision when they were hit by another car at a roundabout. This made the car spin around in a complete circle before finally stopping. It took a little while for the victims to be rescued as they were trapped in the car. The claimant banged his head on the car roof and was thrown around the cabin. Although the claimant was taken to A&E, there was a long wait and so he did not see a doctor. The claimant experienced pain in his jaw but this got better within a week. He also experienced headaches for 2 weeks but these eventually resolved. Following on from the accident, the claimant suffered from nightmares and found it difficult to sleep. He took two weeks off school and did not see a doctor until a month following the accident. He was prescribed only paracetamol. The parent noted that they had spotted a change in the child’s personality and he had become very scared before getting into a car. He was later diagnosed with post-traumatic stress disorder as well as depression. He was taken to Cognitive Behavioral Therapy and did eventually get better. The case went to court 7 and a half years after the car crash had happened and the judge agreed that £11,200 should be payable. Injury caused by an accident at work 3 years from the date of the incident or date of knowledge. Road traffic accident 3 years from the date of the incident or date of knowledge. Slips, trips and falls 3 years from the date of the incident or date of knowledge. Clinical Negligence 3 years from the date of the incident or date of knowledge. Once you have decided to make your claim for anxiety after a car accident, speak to Advice.co.uk. Our helpful and friendly team will look at the details of your case and advise what steps you should take next. They will be able to match you with a personal injury solicitor who specialises in your type of personal injury. Advice.co.uk only provide lawyers that work on a no win, no fee basis. This means that unless your case is successful, you won’t owe the legal representative a penny. There are no hidden costs and no upfront fees. With a no win no fee agreement, you can feel confident that a lawyer will only take on your case if they are sure that you have an excellent chance of winning. If you are one of the small number of people who are unsuccessful in winning their compensation claim then you won’t owe anything. If you are one of the many successful clients then the legal fees/percentage will be taken from your compensation payout. The idea of paying legal fees often deters people from making a claim but with this type of agreement, there is no financial outlay for you at the beginning of a case, making it an easier decision to fight for what you deserve. Advice.co.uk use a client centred approach which means that we always consider what is best for our clients before making a decision. We understand that people suffering from anxiety can find the claims process to be very stressful, so we do our best to remove any burden from the client and take on the hard work ourselves, whilst still keeping our client up-to-date on all the important milestones. We have a team of experts who are very experienced in this kind of personal injury case so you can feel confident that your case is being handled by some of the most experienced people in the field. If you have any questions, our advisors are always on hand to answer your queries and offer advice. If you have suffered anxiety after a car crash and wish to make a compensation claim then please contact Advice.co.uk today. We are trained specialists and any legal representation provided works on a no win, no fee basis to make the claims process as simple and straightforward as we can. Our team are waiting to take your call on 0161 696 9685. Alternatively, contact us via our website and we will call you back. How to get help for anxiety – From Anxiety UK.